management services to our customers. 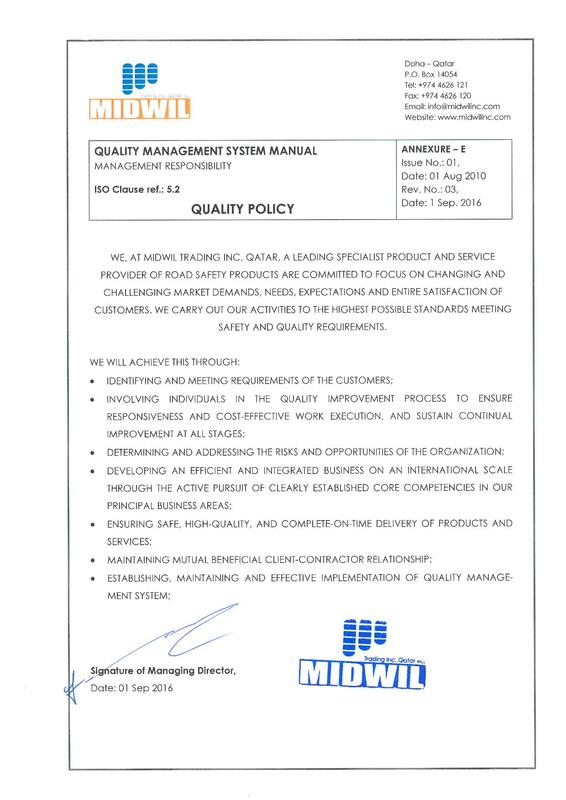 WE, AT MIDWIL TRADING INC. QATAR, A LEADING SPECIALIST PRODUCT AND SERVICE PROVIDER OF ROAD SAFETY PRODUCTS ARE COMMITTED TO FOCUS ON CHANGING AND CHALLENGING MARKET DEMANDS, NEEDS, EXPECTATIONS AND ENTIRE SATISFACTION OF CUSTOMERS. WE CARRY OUT OUR ACTIVITIES TO THE HIGHEST POSSIBLE STANDARDS MEETING SAFETY AND QUALITY REQUIREMENTS. REQUIREMENTS OF THE CUSTOMERS; INVOLVING INDIVIDUALS IN THE QUALITY IMPROVEMENT PROCESS TO ENSURE RESPONSIVENESS AND COST-EFFECTIVE WORK EXECUTION, AND SUSTAIN CONTINUAL IMPROVEMENT AT ALL STAGES; DETERMINING AND ADDRESSING THE RISKS AND OPPORTUNITIES OF THE ORGANIZATION; DEVELOPING AN EFFICIENT AND INTEGRATED BUSINESS ON AN INTERNATIONAL SCALE THROUGH THE ACTIVE PURSUIT OF CLEARLY ESTABLISHED CORE COMPETENCIES IN OUR PRINCIPAL BUSINESS AREAS; ENSURING SAFE, HIGH-QUALITY, AND COMPLETE-ON- TIME DELIVERY OF PRODUCTS AND SERVICES; MAINTAINING MUTUAL BENEFICIAL CLIENT-CONTRACTOR RELATIONSHIP; ESTABLISHING, MAINTAINING AND EFFECTIVE IMPLEMENTATION OF QUALITY MANAGEMENT SYSTEM.